THE WATER ROOSTER IS THE MOST OPEN-MINDED OF ALL ROOSTERS, EVEN IF HIS PERSONALITY RETAINS A STRONG DOSE OF CONSERVATISM COATED WITH A FORMAL PLUMAGE, WITHOUT WHICH HE WOULD NOT REALLY LIVE UP TO HIS ZODIACAL SIGN. A Water Rooster is a calm person who are meticulously responsible, alert, and neat. They are devoted and proud people but don't get too egotistical! The Water Rooster is a pragmatic being, gifted for everything he undertakes, although he can sometimes be handicapped by his immoderate taste for the superfluous. His excessive ambition and his interest in very diverse subjects tend to make him lose time in his projects. However, his charm and ability to attract faithful and devoted friends around him allow him to compensate for his shortcomings and weaknesses, which are still quite rare. 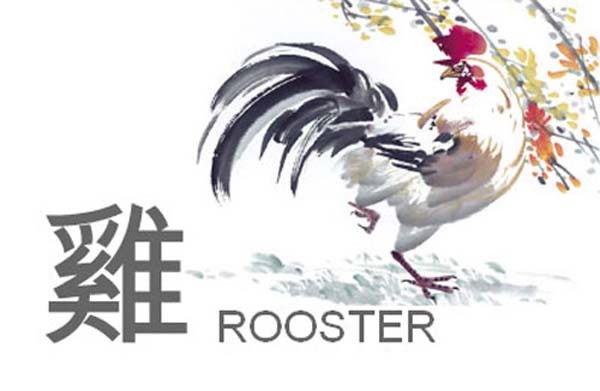 Today, the energies of the Chinese zodiac sign of the Water Rooster favor artistic crafts. If you are married, enjoy a quiet evening at home. If you are single and you have a romantic appointment, don’t get impressed by your partner's fiery declarations during your date, even though it’s always nice to receive such nicely turned compliments.